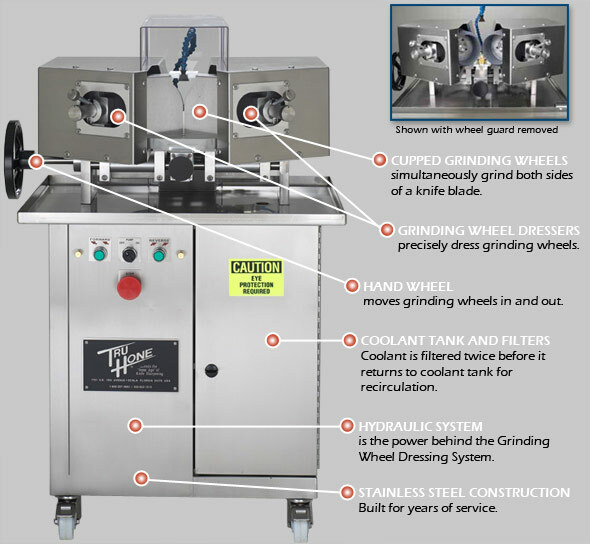 In many modern processing plants, a stone or simple grinding wheel are still used to laboriously grind and hone blades one side at a time. In 1973 Tru Hone Corporation began revolutionizing the sharpening process with it's series of knife sharpening machines, capable of simultaneously finishing both sides of a knife blade. The HG3 Hollow Grinder uses two 6 inch (15.25 cm) cupped wheels to grind the knife blades. The diameter of the wheels never changes with the cupped wheel system which allows knives to be taper ground at the same angle throughout the life of the wheels. Both cupped wheels are synchronizes to rotate in tandem in the same direction either clockwise or counter-clockwise. Changing the rotation is instantly achieved by pressing the forward or reverse button. A precision-calibrated, semi-automatic dressing system maintains the HG3 cupped wheels. By turning the pre-set dial on the diamond advanced mechanism one click, you dress the wheels. Each click indicates an incremental change of 3/1000th of an inch (.0075cm), removing only a minimal amount of the grinding wheels. 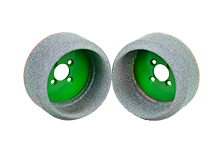 With such an exact, no-guess dressing system, the HG3's grinding wheels last longer, are kept perfectly round and have matched one inch (2.54cm) wide grinding surfaces. The HG3 only removes a minimal amount of metal to taper a knife blade which allows knives to be sharpened several more times than unusable thick knives that have not been hollow ground. The coolant system is synchronized to simultaneously cool both the top and bottom of the grinding area. A mixture of water and coolant additive flow onto the grinding wheels to prevent any heat build-up which could damage the knife blade. It also eliminates dust in the work area. The coolant system is self contained so a water connection is not necessary. A double filter system filters the coolant twice before it returns to the coolant tank for recirculation. Backed by a one year warranty, the HG3 is built to last. Two stainless steel one horsepower, three phase wash down motors with stainless steel 7/8 inch (2.22cm) shafts are each mounted on 1 inch (2.54cm) thick plates that move in and out together on 1 inch (2.54cm) stainless steel rods. The stainless steel cabinet, motor covers, and components assure durability and sanitation. The HG3's entire electrical system is completely sealed and electrical switches are located within easy reach for safety.